Sources: Admission data: BFI, Motion Picture Distributors Association of Australia (MPDAA). Read this sample report and fill each space by choosing one of the words in the box. 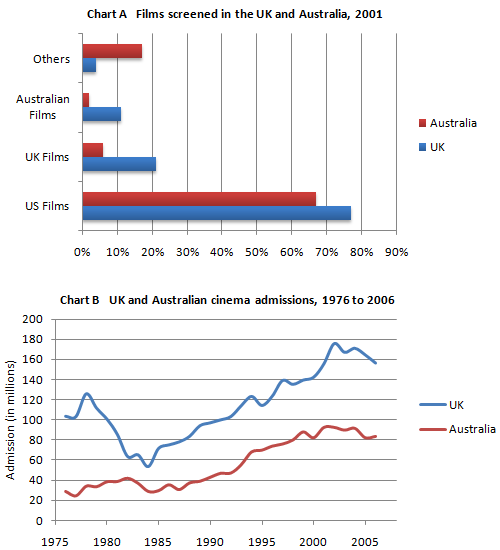 Chart (A) shows the cinema industry’s share of the Australian and UK cinema market by origin in 2001. In both countries, films made in the United States .................... with 77% of the market in the UK .................... to 67% in Australia. UK films .................... for 21% of the UK cinema market and 6% of the Australian market. On the other hand, while 11% of the films shown in Australia were Australian, no Australian films were shown in the UK. Films from other countries had 16% of the market share in Australia as .................... to just 2% in the UK. Chart (B) shows cinema admissions in the UK and Australia since 1976. In both countries cinema admissions .................... in the early 1980s. In Australia admissions .................... from just under 40 million in 1980 to about 30 million in 1984–6 while in the UK the decrease was far more dramatic (from 100 million in 1980 to less than 60 million in 1984). Since then, however, the industry has .................... in both countries. In 2001, cinema admissions in the UK .................... at over 150 million, whereas in Australia they reached 90 million. Overall, the charts show that the cinema has .................... in popularity in both countries over the last 15 years, but that the origins of the films projected in Australia are more diverse than in the UK.